Page speed is important to both your overall ranking in the SERPs and to presenting a positive user experience. We covered both those topics at length in our recent posts regarding how to identify slow pages and the different tools and techniques that are available. But what happens when your entire website goes offline or experiences slowness? How quickly would you be notified of such a problem and would either of those factors have a detrimental impact on your business? Also, consider how much you really know about your actual user experience in terms of website speed and reliability? Luckily, there’s an easy way to protect your business and website against overall slowness and unexpected downtime. 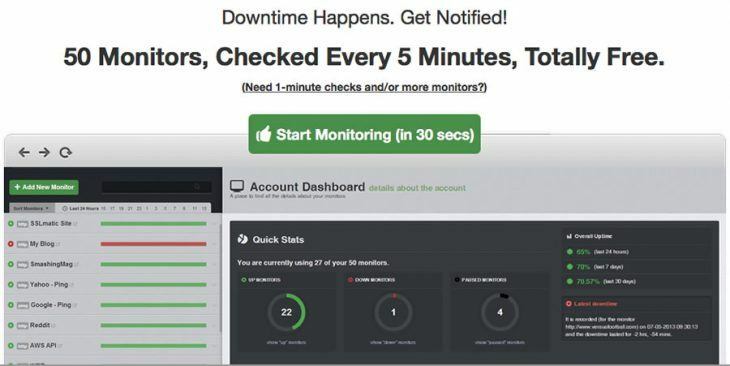 Using free or paid tools, you can monitor site uptime and get real-time notifications to make sure it’s up and running as expected. <shameless plug> if you’re hosted with Pagely then you already have built-in 24/7 performance and uptime monitoring at the server level. Pagely engineers get real-time notifications and interdict on your behalf anytime there’s an issue affecting performance or uptime. </shameless plug> Here are some tools you can use to monitor your WordPress site regardless of where you’re currently hosted. It’s important to keep an eye on your website’s overall speed and uptime at regular intervals during the day. A website that is down or unresponsive can be expensive both in terms of lost revenues and frustrated visitors. There are dozens of monitoring services available and prices range from free to several hundred dollars per month for enterprise level service. We’re covering just four options in this post. Not because any of these represents a better choice than the others but because they’re an appropriate sampling of the different options and feature levels that you are likely to find when doing your own research. Jetpack monitor is a free service offered as part of the WordPress Jetpack Plugin by Automattic. It’s a relatively simple solution that can be activated in just a few clicks from within the admin dashboard. Once activated, Jetpack Monitor will ping your website every 5 minutes. If at some point it looks like your site is down, you will be sent an immediate email notification. Following the initial notification, you’ll receive a second notification after 60 minutes and then another notification when it appears your site is back online. Jetpack Monitor does not monitor site response times. If monitoring website uptime and response times are critical to your business, Jetpack might not be the best solution. As a free service, there is little information on the reliability of the service and the ability to test from multiple servers is not indicated. In addition to offering both uptime and response time monitoring, a major feature of StatusCake is their real browser testing. This means that when your site is tested, their system literally opens a browser and navigates to your website. The entire page downloaded and rendered, including HTML, CSS, Java, and images. This provides an accurate picture of the response times for a real visitor. As a simple monitoring service, Uptime Robot is a lower priced but a less feature rich option than StatusCake. Paid plans start at $4.50 per month for 1-minute monitoring intervals, response times, and 12 months of logs. When Uptime Robot detects a problem, their service will alert you via email, SMS, twitter or via web hooks. Uptime Robot is an inexpensive and basic solution, but for a few dollars extra per month, you can access more feature-rich services. As what is probably the most popular website and server monitoring solution, Pingdom offers complete plans from their Starter at $14.95/month all the way up to Enterprise at $495+/month. Website checks are completed at 1-minute intervals plus they provide transaction checks that make sure important elements like search, cart check-out, and sign-up forms are working. Their real U/X monitoring provides valuable feedback from visitors in different countries using a variety of devices and browsers. Access to historical data and real-time data means you can see how your site is functioning at different times of day and in different time-zones. Pingdom offers what is probably the most advanced alert system of all the providers. You have complete control over not only which events trigger alerts but who on your team should receive those alerts. The cost of monitoring your website uptime and speed is a small price to pay for peace of mind. Although your natural inclination is to monitor for unforeseen events and problems, a service like Pingdom can provide some real insight into the experience of your users. Being able to monitor the speed of your site on a variety of browsers and in a variety of countries can provide actionable advice and pinpoint potential problems that you were not previously aware of. If you currently rely on a third-party service to monitor your website speed and uptime, what are some of the insights you have gleaned from its use? Please share in the comments below.